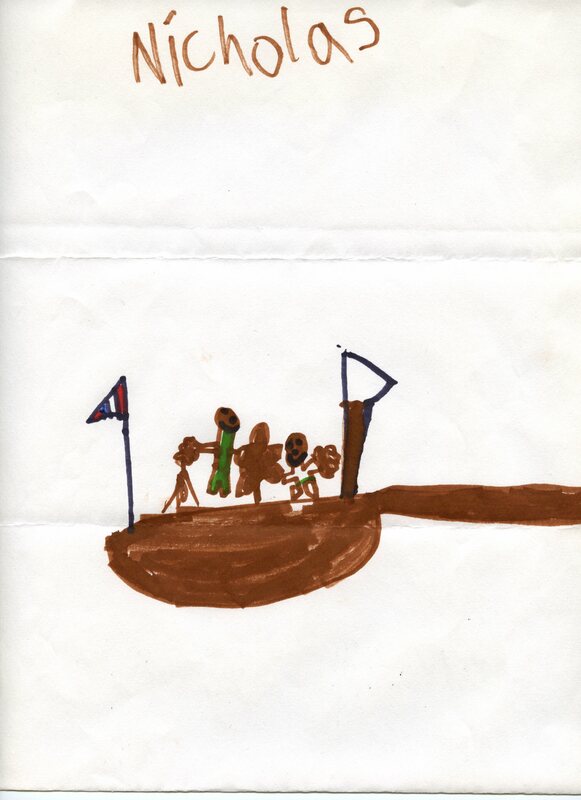 This is a drawing of the RELIANCE model that was given to us by Nicholas, age 6. Thanks Nicholas! 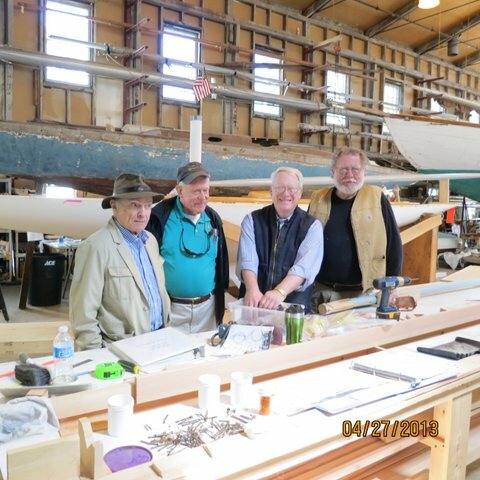 This entry was posted in Project Manager's Welcome on May 4, 2013 by Herreshoff Marine Museum/America's Cup Hall of Fame. Here I go again on a periodic tangential blog post. 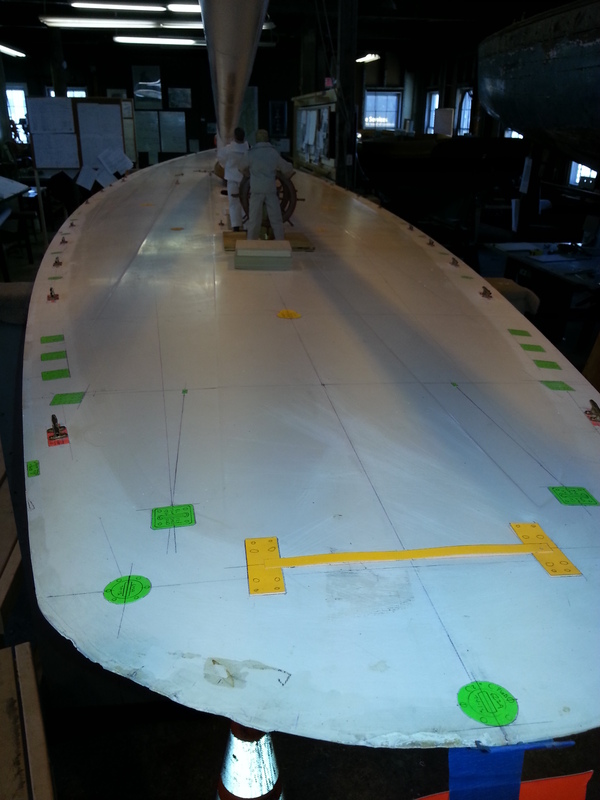 As you can see in the enclosed picture, we are laying out all the fittings that go on deck. We have beautiful cleats from J. M. Reineck done in his business shop on a CAD machine with all the machine tools and jigs to make many parts exactly the same, including posts to fasten these cleats to the deck. On the other hand, we have exquisite craftsman-made parts from Mike Mirman in his home shop. BUT, it is so nice to just create one template for drilling attachment holes for 15″ cleats rather than custom-fitting attachments for each of the dozen #6229 pad eyes! SO, didn’t we just have an INDUSTRIAL REVOLUTION moment on the RELIANCE Project! As Tim Horton (Our team psychologist and jack of all trades) said “You didn’t think that Henry Ford custom-made each cylinder did you?” I must admit I DO like the custom, craftsman approach. There is something about the statement” HAND MADE IN THE USA BY A CRAFTSMAN” but wouldn’t it be nice to have CAD accurate parts with engineered strength already confirmed; if only it were cheaply and readily made! We’d be done and you’d be enjoying this beautiful replica. 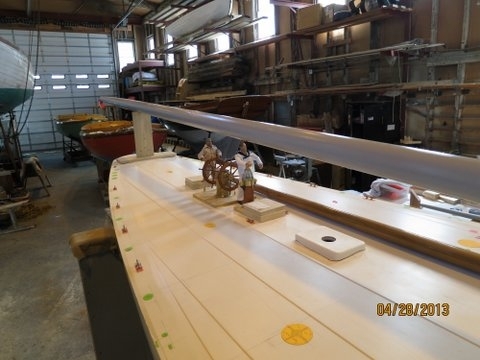 BTW, in the picture, we have cut off 4′ of extra length from our mast and fitted it as a stump mast for the time being. I think we’ll hang the boom from it shortly, if for no other purpose than reminding us of the immense size and girth of these two sticks and to get us giggling about building such a monster in one-sixth scale with such tiny fittings attached to such large sticks. We do have those moments! 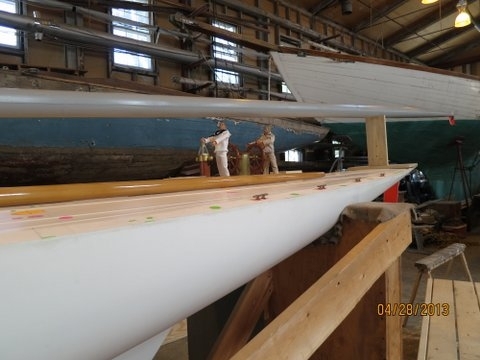 This entry was posted in Builder's Notes & Pictures and tagged cleat, Herreshoff, RELIANCE on May 3, 2013 by Herreshoff Marine Museum/America's Cup Hall of Fame. 110th anniversary of RELIANCE being turned over to the Iselin Syndicate. April was an exciting month for RELIANCE. From this date RELAINCE has about 130 exciting days in the water to conclusion of America’ Cup and her career. Follow her journey with posts from John Palmieri, Curator Emeritus. 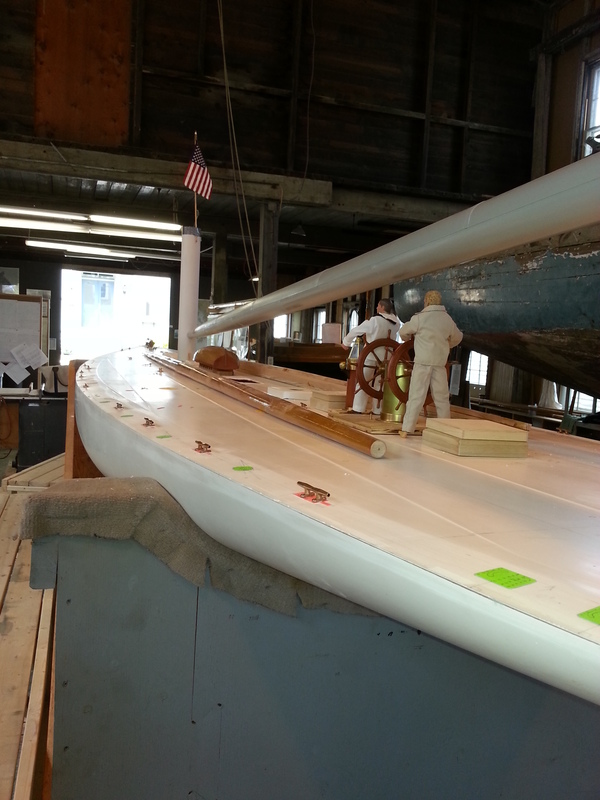 This entry was posted in Curator's Notes and tagged America's Cup, Herreshoff, RELIANCE on May 2, 2013 by Herreshoff Marine Museum/America's Cup Hall of Fame. This weekend marked a number of key events for the RELIANCE Project which we’d like to share. First, and very importantly, on Saturday Joe and Barbara Bartram, who have generously provided the funds to build RELIANCE and have been our strong cheerleaders, made a visit from Florida to our Building 28 to see our progress for themselves. A very, very happy time for all involved. As you can see, a number of our team members were able to be on hand. I’d like to thank them and all of the team for their support! HURRAH! 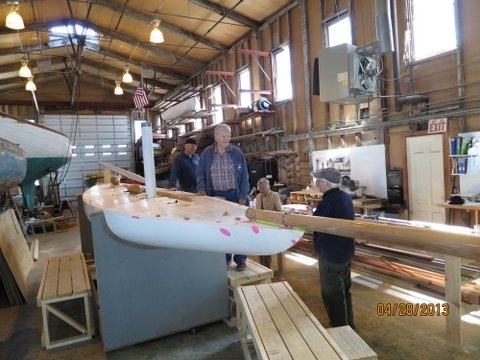 – A late afternoon closing time visit by “Chuck” who overheard Jim Reinbeck, his son and I talking about making 40′ of sail slide track and 200 sail slides to scale. It turns out that Chuck is a retired machinist, tool and die guy who also taught at the Jewelry Institute. He can read and interpret complex plans upside down faster than anyone I’ve ever seen. And then come up with such simple and creative solutions!!! Wow. After an incredibly interesting (and intense for me) hour Chuck had to hurry off. So Chuck, if you read this please come visit us. We need you! 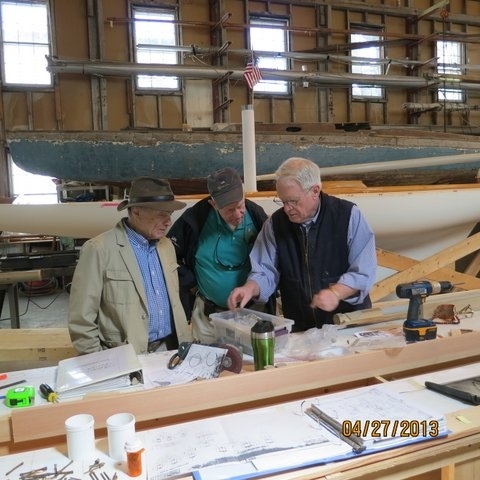 This entry was posted in Builder's Notes & Pictures and tagged Herreshoff, RELIANCE on May 1, 2013 by Herreshoff Marine Museum/America's Cup Hall of Fame.